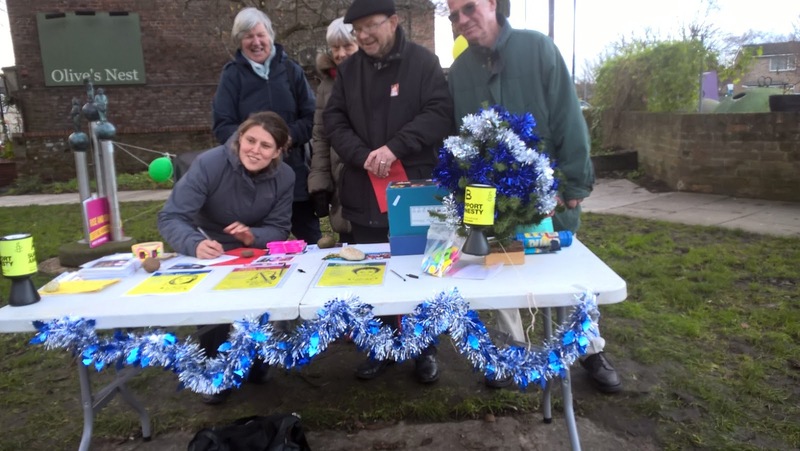 Rachael Maskell (Member of Parliament for York Central) and members of the public signed 138 cards with messages of support and solidarity to Atena Daemi, Vitalina Koval and Marielle Franco's next of kin at our stall on Bishopthorpe Road in York on Saturday 8 December. We set up our card-writing stall every year. The event is part of "Write for Rights", when Amnesty International supporters all over the world write millions of letters and cards for people whose human rights are threatened. The event takes place close to Human Rights Day, which is celebrated across the world on 10 December every year. The date was chosen to honour the Universal Declaration of Human Rights on 10 December 1948 - so this year marked the 70th anniversary. Atena Daemi was jailed in Iran, for speaking out against the death penalty. Vitalina Koval is an LGBTI activist who was attacked by the far right in Ukraine. Marielle Franco was killed for defending the people of Rio da Janeiro in Brazil. Our next monthly meeting takes place on Tuesday 8 January at the usual venue - York Friends Meeting House, Friargate, York YO1 9RL. We do not have a guest speaker but this month's meeting will include our Annual General Meeting so we start at 7.00 pm. Everyone is, as always, welcome to attend.